Hi. 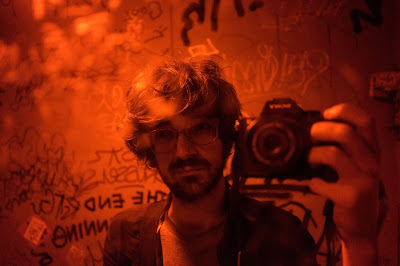 My name is Miguel Nogueira and I am a concept artist and designer at Frictional Games. My job is to create art for concepts that we might or might not add to the game. The point of concept art and design is planting creative seeds in others through the means of art, to spark debate on the suggestions, and to bring the concepts to life from sketch to product. I love horror and fiction, so when the opportunity to join Frictional as a freelancer game in August of 2017, I was too flattered to say anything but yes. And in October of 2018, I joined the company as a full member. As a video games maker, I naturally played a lot of games when I was younger – almost to an unhealthy point. As a 7-year-old kid, this box that I could play on without going outside, or without touching physical toys, was like black magic or voodoo to me. The first game I played was the very first Wolfenstein 3D, released back in 1992. I wanted to reverse engineer the game. While trying to do so, I broke the computer and got grounded so many times that it wasn’t even funny. Fixing a computer or operating system error was not only hard in the early 90’s, it was also expensive… But I was fascinated by it. The 7-year-old me had a plan to one day master video games. Besides that, like any true 90’s kid, I owned many cheap consoles that ran Super Mario, Bomberman, Duck Hunt and all that other fun stuff. But they weren’t that inspirational – I thought of them as merely a hobby or a fun way to pass time. It was only when I got back into computer games that the immersion really kicked in. Eventually, I got the desire to be a part of the vanguardist front of the current game making age. While in college, I was still playing a lot of games. I was studying graphic design and multimedia arts, so video games actually inspired me to come up with shapes, colors and designs. Around that time Dark Messiah and the Metal Gear Solid series were what glued me to the screen. 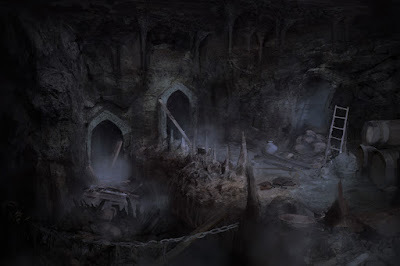 There was something about Dark Messiah specifically, its environments, ambience and designs, that was so magical, but at the same time so haunting. It really drew me into the tales of primordial myth – the ones that make you ask what if? I got into horror way late. I was just looking for ways to relax with films or, so didn’t get the hype of media that would scare me or stress me out instead. But later on, I realized that there was also good horror out there, like there is in any other genre, full of mystery that unveils slowly. And then there’s, you know, the cheap stuff. Ever since I was that 7-year-old, a part of me had subconsciously wanted to break into the creative field of concept art. I first found out about it when I was 15, and it was thanks to DeviantArt. Back then, around 2005, the site was at its prime, and the only good place to discover and share art. All the art there was mind-blowing, but there was something about concept art that I really loved. College itself was tricky for me. When people ask me if it helped me to get a career in games, I’m still on the fence. There was a love-hate relationship going on. On one hand, college provided me with inspirations that I will keep my whole life. It taught me about the European vanguardist artists and how their approach changed the art world, about the importance of the industrial revolution in arts and crafts. I learned about how public installation artists draw attention to their work, and so on. There were classes on graffiti and expression, typography, fine art… and those lessons are priceless. They were a nudge in the right direction. Without someone to teach me about them, I would not have found out about these topics for years. On the other hand, to get any jobs, I had to lock myself in a room and put hours upon hours into practicing art. It’s something you just have to do to get to the next level of art, and it’s something college just doesn’t quite nurture. So I cannot give a definitive answer on college. I was either fascinated by the subjects presented at classes or hated myself for being there instead of sitting at home and practicing drawing. After college, I took a year off to work on and perfect my craft: drawing, painting, designing… After that I took on whatever freelance job I could find, then found work at indie studios, and gradually ended up at more known studios. This was a turning point in my career, because I realized I was playing in the big league now. One day you’re someone’s groupie and the next day you’re working with them. Every time I connect with a studio or professional I’ve respected for a long time, my energy meter is filled for a long time. I feel the burst of stamina and will to work out of nowhere, like an energy blast. It’s my muse, really. It is the reason I’m fortunate to say that every day may turn out better than yesterday. And then one day Frictional contacted me because of an email I had sent a long time ago, saying they wanted me for a work test. I passed, and so the journey in Secret Project #1 began. I didn’t know it yet, but it was about to be a wild ride! I started at Frictional as a full-time concept artist. All the briefings were cool, interesting and creatively demanding. Working full-time meant I could work on what I liked all day. There was never a day where I thought gee, I wish I could work on something else instead. Soon I was working on props for pretty much all the levels on the project, then moved to characters, then environments – and now I do pretty much anything that comes my way. When it comes to my work, I try to bring my sense of graphic design into the aesthetics and my experiences into storytelling. I also like to think in analogies, metaphors and jokes, which I like to sneak into the designs. I feel like every concept has capacity to be something more than just itself or what it looks like at first glance. So I try to add some substance, work on aspects of what the concepts stand for, and make sure they’re not too literal or easy. Besides that, I love studying and getting all into different subjects, as there is more chance of finding valuable things the deeper you dive. I draw diagrams, study anomalies of human DNA that can be used in monster designs, consume culture and subculture, capture accidents to use in a different context, experiment and drift, love my experiments as I would an ugly child, delay criticism and judgement. I do a lot of work where I’m focused on details and injecting story elements into the props, environments and other bits of the world. While working, I have recalled some of my memories related to Dark Messiah. In the game there was a statue in a haunted necropolis that you could choose to interact with. It read something like: “Here likes cursed so and so. 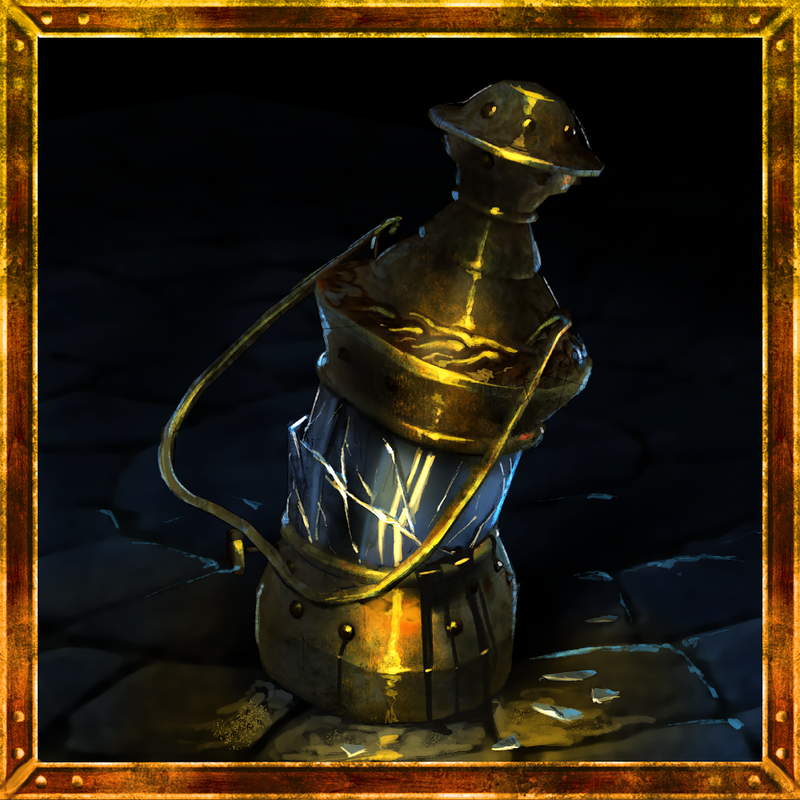 For his crimes against the king, let his torment be eternal.” It is a really trivial detail and I am probably among the 1% of players that noticed it, but it just added a lot of believability to the world. A lot of these romantic ideas and memories I have about games are blurry at best and inaccurate at worst. But they are something I gravitate towards when making my art. I study what other games have done well, find out why these things work, then adapt the formula to my own work. I could go on about my favorite comics, films and games. But to be honest, every time I pick up a new book, game or film, there is a possibility that it will leave me with a long-lasting memory. And for me, that is very exciting. Like most people at Frictional, I work from home – and in my case it happens to be the sunny Porto in Portugal. Here I have my work sanctuary, aka my office, where all the art making process happens. 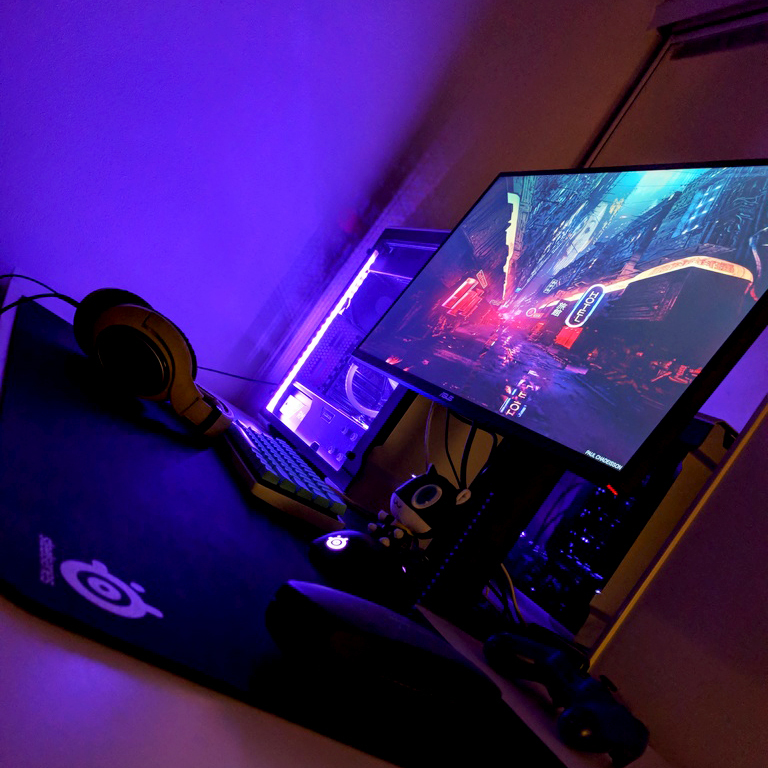 My desk and setup are something I’m proud of. It’s just tech, but because I built it myself, there’s another level of affection I have for the tools. It must be a nerdy thing. Besides the obvious hardware my setup sometimes has a book or a magazine on graphic design, a ball or a fidget spinner to play with while I’m analyzing references or trying to focus mid-brainstorming. Simply reading a couple of paragraphs between drawings or throwing the ball at a wall for a few minutes is enough to get all the parts of my brain working again. Which leads me to my last point: I want to close this with advice to aspiring video game artists. Sometimes us industry people are too serious and forget to have fun. We forget we’re making games. A lot of times artists tend to copy what is popular in the industry, which is fine, but there is also a whole world out there to get influence from. Following in line with the entertainment industry will only get you so far. I find that the art that I actually stop to look at for more than three seconds is the kind of art where the artist is communicating something unique to them, something only they can say – not a copy of a copy of a copy. The bandwidth of the world is much broader than what you can get through your internet connection or TV set. Get some inspiration from unlikely places: graffiti, typography, furniture design and fashion, nature, travel… Everything has the power to amplify what knowledge you already have and show you entirely new avenues of exploration. After 3 years of hard work, we are now close to finishing one of our new games. We want it to look amazing, and to accomplish that we need more (hu)manpower. 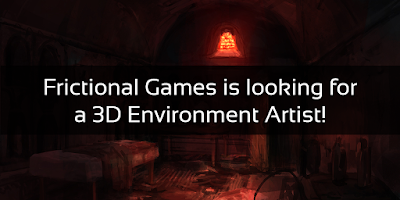 We are now looking for an experienced 3D artist, who will focus on environments and props for our upcoming horror game. Our ideal person loves horror, and is able to convey atmospheric environments and terrifying scenes through 3D art. The position is full-time and project-based, lasting for about a year until the new game is ready to be shipped. We are quite a small team, but we consider that our strength. As an environment artist you will get to work on every level of the game, ranging from small props to whole levels. This means your contribution will greatly influence how the final game looks, plays, and evokes emotions. Combining various techniques to create special effects, such as flowing water or fire. If you want to know more about Frictional work practices, you can check out the introduction post of Rasmus, who will be your closest teammate. You have to be a EU/EEA resident to apply. The person we’re looking for is creative, driven and most importantly self-sufficient. Since the position is project-based, we are looking for a person who can start as soon as possible, end of November the latest. Experience kitbashing/working with modular sets. If all of the above piqued your interest, we would love to hear from you! Send us your application 4th of November the latest - but the sooner, the better. Examples of works that have inspired you or blown you away. Please notice that you need to send all of the applications to be considered. The position is full-time and permanent. Ideally we would help you relocate to Malmö, Sweden to be close to our core team, but this is not a necessity. We also encourage working outside of your area of expertise, and always learning new things. The more areas of development you are willing and able take part in, the better! If you want to know more about Frictional work practices, you can check out the introduction posts of Peter and Luis, who will be your closest teammates. The person we’re looking for is creative, driven and self-sufficient. We are a small team, which means you will be able to work on a wide variety of things and contribute to our future games in a meaningful way. We also believe a healthy balance between work and life reflects positively on your work. We offer a variety of perks for our full-time employees, especially who live in or relocate to Sweden. We also don’t encourage crunch. Fun workmates, game and movie nights, and other outings! Did the position pique your interest? Are you the person we’re looking for? Then we would love you hear from you! We will be looking at applications until 30th of October 2018. 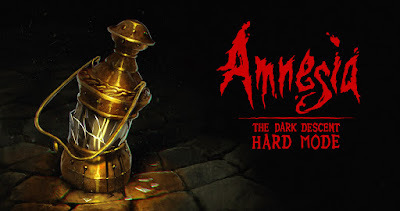 What is Amnesia’s Hard Mode? A year ago we brought SOMA to the Xbox One, and along with it the Safe Mode. The optional mode removed the hostility of enemies and let players explore Pathos-II in relative peace. Most players were pleased with it, and at best it meant that players that hadn’t dared to traverse the Atlantic ocean floor before now had a chance to experience it. Now finally releasing the Amnesia: Collection on Xbox One, and decided to also spice it up with a little treat. We bring you the polar opposite of the Safe Mode: the Hard Mode! Amnesia: Collection will be released on Xbox One on the 28th of September, after which the mode will be available on Xbox and PC. What is the Hard Mode? It is really just as the title suggests: a mode that makes it harder to beat the game. You know, in case The Dark Descent wasn’t stressful enough for you. - There is no danger music when the monsters are near. So in summary: the environments are harsher, the monsters more unforgiving, insanity is deadly, and death is final – unless you pay a toll. You can pick between normal mode and Hard Mode when starting a new game of Amnesia: The Dark Descent. The mode changes some fundamental elements of the game, and therefore can’t be changed halfway through. A Machine for Pigs and Justine do not feature this mode. How does this affect achievements/trophies? Beating the game on Hard Mode will earn you a new trophy called Masochist. Because, you know, you pretty much have to be one to complete the mode. The mode affects the Illuminatus achievement, which you can’t get during playing in Hard Mode as it reduces the amount of tinderboxes throughout the level. Will it be on all platforms? Yes! The Hard Mode will launch on Xbox and PC versions (Steam, GOG, Humble Bundle) simultaneously. We have started working on the PS4 version with our porting partner, and hope to have it out soon. Want a Hard Mode wallpaper? Download a 4K version with and without the logo on our public Drive folder. Today, the 16th of July 2018, Simon Jarrett would have turned 30. He never quite made it, the proposed treatment for his brain damage proving ineffective. And yet he did. A Simon Jarrett made it to the ARK, facing eternity among the stars. Another(s), infinity below the sea, at least as long as the batteries last. But he didn't just live, he left a legacy. His scan, for a generation of programmers to use. The ARK, preserving humanity until the Sun burns out. Simon lives on in every fanart, every mixtape and cosplay. He gets a different story in a fanfic, be it finding a cure, finding love, sometimes dying, yet still living on through those moments. You have taken him well beyond 4.0, and for that we are thankful. As a small celebration we have collected 30 of some our favourite fan works of Simon, one for each year since his birth. In all honesty 30 is an arbitary number, a cutoff point to keep this post from being far too long. We love each and every one of your fan creations, as well as mods, meta commentary and even just coming together as a community. From us, and from Simon: thank you! Zerachieamora is one of the top creators in our community, having done cosplays of all our protagonists, as well as having time to run ask blogs and make art. Their stuff always has top-notch detail and creativity. We certainly hope our next protagonist will be cool enough to inspire them to make another cosplay! You can also find Zerachielamora on Twitter, Instagram and Deviantart. Sketchinisfun has made a lot of awesome contributions to the fandom, such as Tiny Catherine, but this animation has to be our favourite - everyone knows just how much dedication that requires! Lumipaiio's forté is drawing incredibly dynamic Simons and Catherines. Just look at him go! It is so hard to pick a favourite! Lumipaiio have also drawn an incredible concept called Leggy Catherine, among other things. It's cute! It's small! 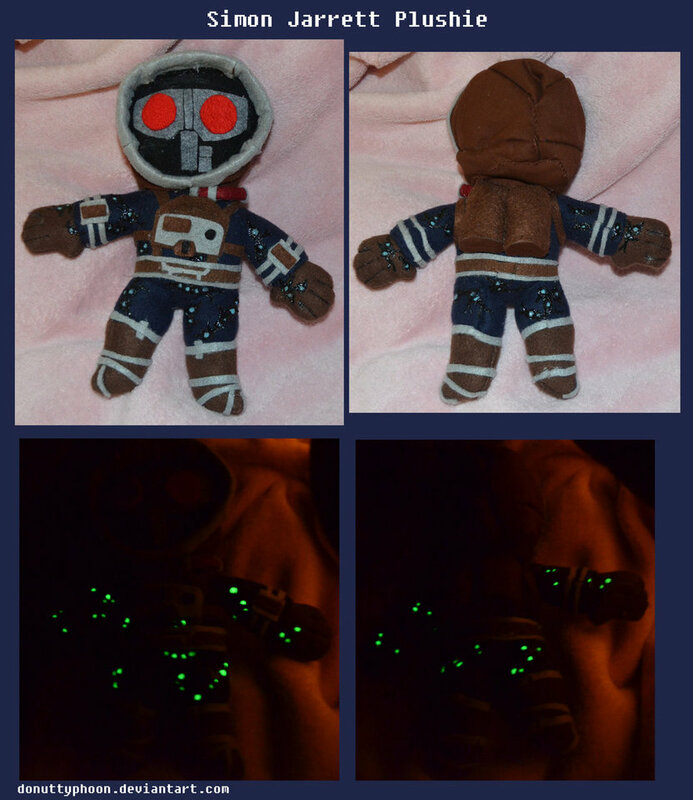 It glows in the dark! It's a perfect boy. Rabbitintheheadlights is asking the right questions. Note how we don't have mirrors in the early game? Bardicles draws the cutest little Simons, and keeps us entertained with their short comics! One of our favourite levels deserves some love, and Shaidis delivers! This piece is beautiful, and it is no wonder it shows up whenever you search for SOMA fanart. Is it a screenshot? Nope, just Rennerei working their magic! This pick might be biased as our community manager has followed Rennerei since the early TBFP/Motorcity/TF2 days. It is truly inspiring to work on something, and then receive fanart from someone you admire. You can also find Maren on Twitter and Instagram. Adam has done various cool pixel art pieces from SOMA, as well as Amnesia, which you should definitely check out in their Frictional tag on Tumblr. 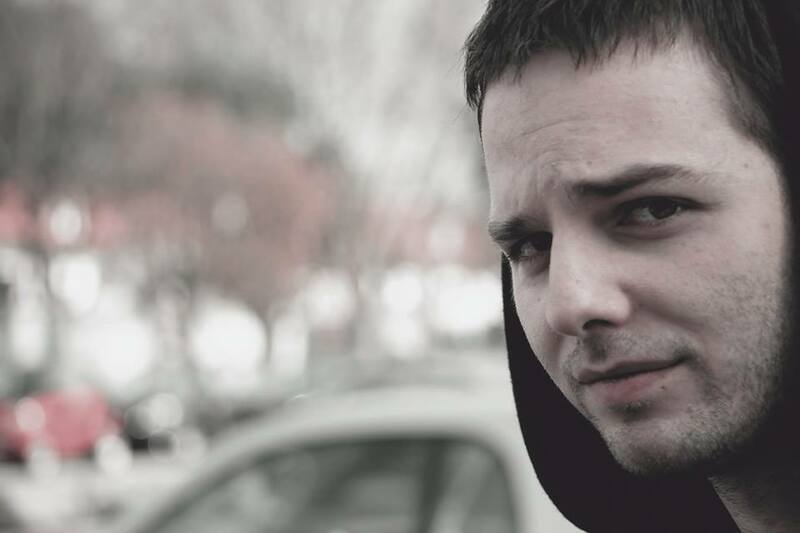 You can also find Adam on Facebook! Doseph has made an incredible set of all our major protagonists that you can find in their Frictional Games tag. The detail, atmosphere and claustrophobia in the works is astonishing. Fayren does amazing original work, but it is an honour that they took time to create fanart for us. They has also made another piece of SOMA fanart that we have up on our wall in the Malmö office. You can also follow Fayren on Twitter. 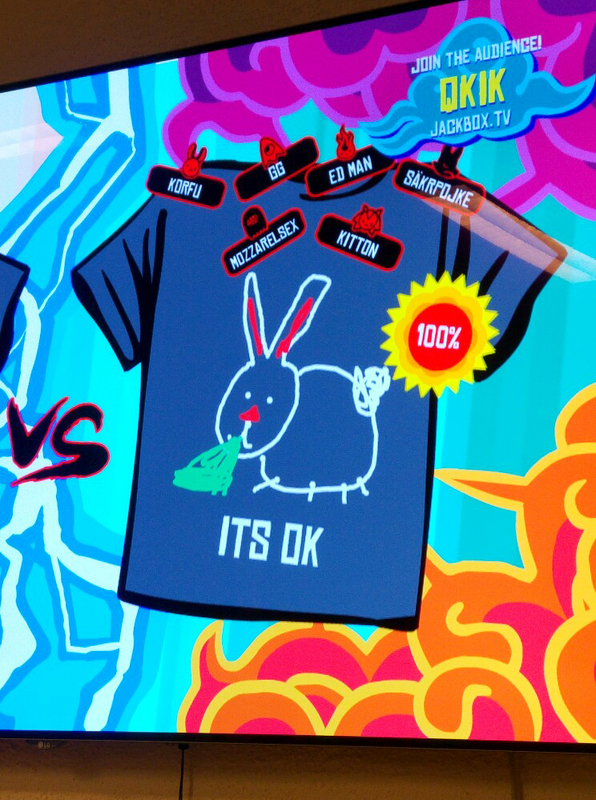 We're serious developers, but not too serious to enjoy some light-hearted wall punching! This is what any of us would do, isn't it? Watch out, Simon, you're glitching out! Looking at your hands won't help you escape this nightmare. You can find more art by KylieRusek on Twitter and Instagram. These are some good, chunky boys - thank you Wachtelspinat! Knowing Simon, he would probably own that hoodie. The creatures at Pathos-II might be terrifying, but that carpet is even more so! But this Simon is braving it like a champ. Simon is an obviously unreliable narrator. He could have been a Roomba the whole time for all we know! Ess and her brother did an amazing job on the diving suit, down to the glowing eyes, WAU-infested trousers and even an Omnitool! And Simon eating pizza with a kawaii Reaper is the crossover we didn't know we wanted, but have now been enlightened. Sadunacc has created a lot of lovely fanarts, including some more beautiful Leggy Catherines. But this doll is so unique we had to share it - just look at it! A pocket-sized Simon! It is always cool to see artists' work progress - and for this work you can also see the progression shots! Piranyeaah did a lovely job capturing Simon's confusion. They are friends! They are on an adventure! And nothing bad will happen! If you're Simon and I'm Simon... then are there also other Simons, possibly disguised as Roombas? Let's not think about that, and instead think about how nice it is to see all of them together. This is the smallest walk cycle of all time. And it's adorable. Is this a Simon, or is this a squirrel? He sits silly, but we still love him. If this won't make them get along, then nothing will. Inspiring people to push their limits and make something awesome is great! Steampoweredwerehog - if you're reading this, we'd love to see the final cosplay! These were the good times! Glad to have them captured in a picture, forever in a state of ":D". You can find all the SOMA pieces by Cprartsalot in their SOMA tag! But if we had to pick our favourite, it would be this one. Just look at that Minecraft boy go! Just don't stay underwater for too long, we can't guarantee this skin will make you into an actual diver. And to end things off, we present this piece of art. We can let Simon have a happy ending. At least for this one day. Frictional games are filled with terror, intrigue, mystery, and emotion. We want our environments to reflect that, from the shape of the landscape to the smallest rock, while subtly guiding players and helping to enhance the gameplay. 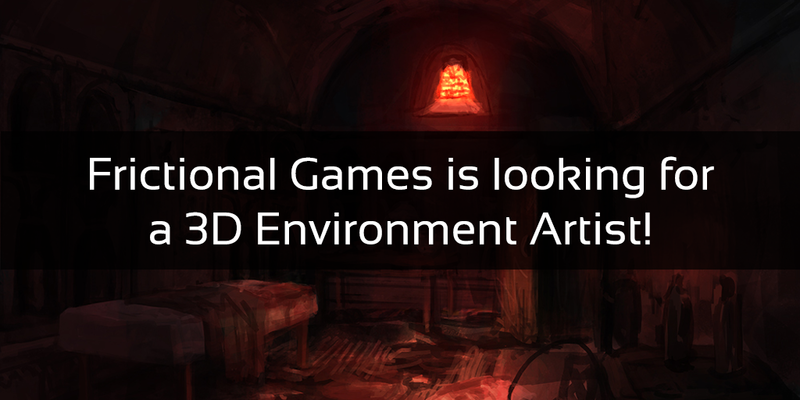 We are now looking for an experienced 3D artist, who will focus on environment design for our upcoming games. 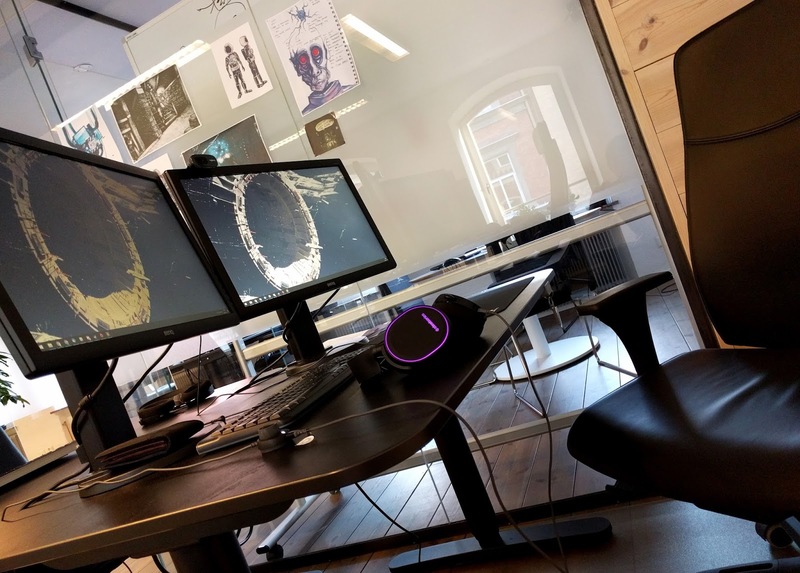 This means working closely with our gameplay programmers / designers, and using modelling, texturing, and design skills to create memorable, interesting, and functional environments for our players to experience. We are quite a small team, but we consider it our strength. 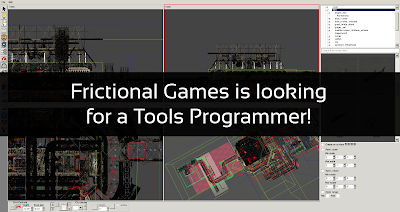 As an environment artist you will get to work on everything from props to high-level design. This means your contribution will greatly influence how the final game looks, plays, and evokes emotions. Collaborating with designers to create level layouts, combining both gameplay and an artistic perspective. Taking levels from whitebox to a polished product. Creating basic models that make up the levels, such as walls and floors. Modelling props of various complexity, both with and without the help of concept art, and often having to take gameplay concerns into account. Constructing particle systems, both by drawing textures and using parameters in our editor. For some examples of our environments, please check the video above! The person we’re looking for is creative, driven and self-sufficient. We have recently set up a central hub in Malmö, Sweden, and hope you can move over to our seaside city sometime in the future. You have to be a European resident to apply. Good understanding of composition and player guidance. Ability to challenge yourself, make bold creative decisions, and try non-conventional things. A critical approach to your work, with the ability to take a step back and reflect. A strive for structure, efficiency, and clarity. Interest in and ability to do research for interesting prop and environment solutions. Love for working on a variety of tasks. Excellent skills in 3D software. Modo preferred. Excellent skills in Photoshop or similar software. Basic rigging and animation skills. Love for horror, sci-fi, and narrative games. A major role in completing at least one game. We make games, because that’s what we love. But we know there are other things we love, like playing games, taking part in sports, or spending time with our families. We believe a healthy balance between work and life reflects positively on your work, which is why we don’t encourage crunch. Opportunities to influence your workflow. Variety in your work tasks, and ability to influence your workload. 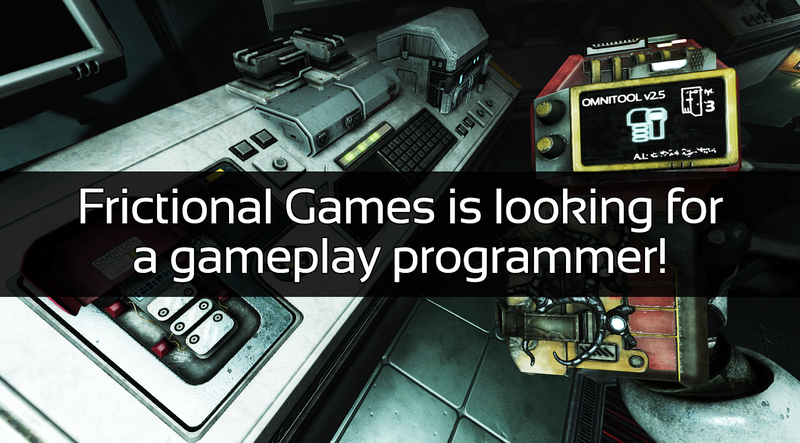 Participation in our internal game Show & Tell sessions, so you’ll have input into all aspects of the game. Social security and holidays that are up to the Swedish standards. An inclusive and respectful work environment. An office in central Malmö you can use as much as you please. After 3 years of failed experiments, Professor Kim finally managed to reverse gravity. However, the professor died just as he succeeded, and the whole thing ran amok. The player enters the research facility where the experiments took place. As they go through the level, they gradually learn about what the professor was trying to achieve. 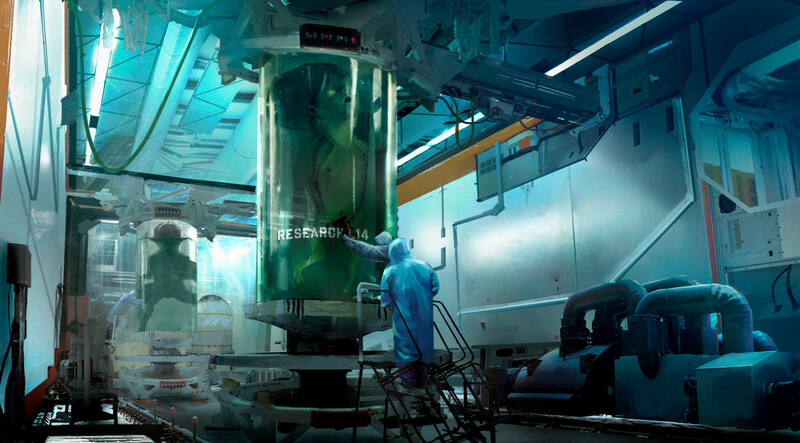 At the end they’re met with a revelation, and see the disturbing results of the experiment. As they reach the end, the level must loop in a way where the player finds themselves near the entrance, where they first started. We are looking for a simple design, done as a rough 3D sketch/white box. You are free to write notes and do paint-overs on top of the 3D. This test is a first step in the evaluation process, showing us your basic skills, so we are not looking for you to spend a lot of time on it. Imagine this as a quick proof of concept you would present before doing a pitch or a design. 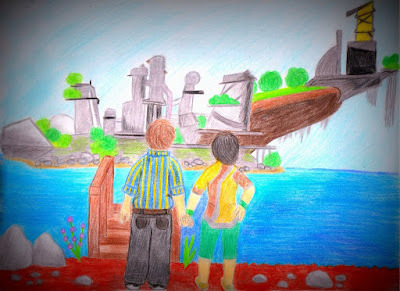 We will evaluate your artist vision, creativity as well as level design skills. Put everything as a collection of images into one folder on Dropbox, Drive or similar, and send the link to us. Hi there! 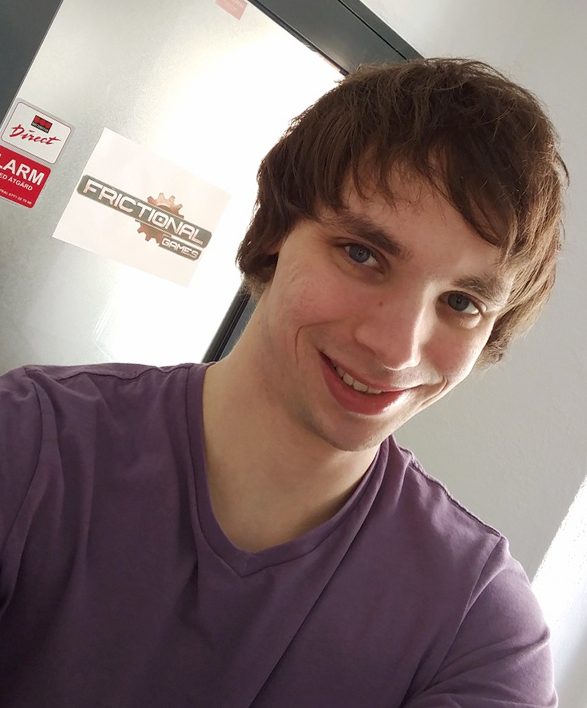 I’m Gregor and I’m a designer and programmer at Frictional, which means I’m responsible for all the fun events in our levels. Okay, maybe they’re fun just for us. I’m a more recent recruit, having joined around September 2016. My job description, gameplay programmer / designer, is purposefully vague. While I mainly work on level scripting, I also spend time on AI, gameplay systems and level design. I also worked on our collaboration with the Tobii Eye Tracker, which I will talk about later. The great part about this is that my work never gets stale and almost none of my days feel the same. I’m originally from a little known country called Slovenia, but I’ve recently moved to the land of the vikings to become one myself. Or, in other words: I moved to Malmö around two months ago and now work from our fairly new office. I absolutely adore our office and go there pretty much every day to socialize with and get inspired by my co-workers. I’m also the one who nags everyone with occasional movie and gaming nights, where we usually grab some snacks, relax and watch a horror movie (obviously), or games like FIFA and Jackbox Party Pack! I can’t really remember the time when I first started playing games. I do know that around the late 90s my dad brought home an Intel 80186 PC one day, thinking he would use it for work. He was wrong. After he showed me a couple of MS-DOS games and I realized I could make things move by pressing buttons, I became glued to that PC. My parents didn’t manage to pry me from it, so I’ve been playing games ever since. Not on the same machine, obviously. I played a lot of games, but didn’t touch the horror genre for the longest time. I still remember having vivid nightmares and being unable to sleep whenever I saw something remotely scary on television. When I was older, however, a friend of mine bought me Amnesia as a “gift”. It was a dare, of course, but because I didn’t want to disappoint my friend, I played through it. It was just as scary as everyone was telling me, perhaps even more so. But while I was playing it I also realized that it was about more than just scaring the living hell out of me. It managed to fully immerse me in its world and story, which I had not experienced to this degree before. This is how I got introduced to the horror genre, and to Frictional, which would later impact my life more than I could have possibly imagined. Making games has been my dream ever since I can remember. Given how much fun I had playing them, I thought it would be great if I could make my own – which is why I always liked messing around with settings, seeing what I could do with cheat codes, and figuring out damage formulas so I could get an advantage. It wasn’t until I got sucked into a game called Jedi Knight: Jedi Academy, however, that I actually made my first array into creating my own content. I made lightsaber hilts, maps, and even modified some scripts to make the game play like I wanted to. Unfortunately, growing up in Slovenia there was no real game dev scene there, so I forgot about my dream. It simply never occured to me that I could make games for a living. However, since I was already using my computer so much, I thought it would be fun to work in IT. So I learned some basic C++ programming in high school, then went to a computer science university where I learned a lot more about programming and software in general. For a long time I resigned myself to becoming a web developer, taking some summer jobs and part-time work in that field. The job became more and more mundane and boring, until I finally realized that I couldn’t do it long term, and that I had to find something more fulfilling. That is when I remembered my dream of making games, how much fun they brought me and how great it would be to be able to help someone else have the same experience. I already had a lot of programming experience, so I became determined to join the games industry. I immediately quit my part-time job and started working on my first small game. I wanted to do everything on my own so that I would learn all the intricacies of game development. A year or so of studying and work amounted to Welkin Road, a little puzzle platformer with grappling hooks. 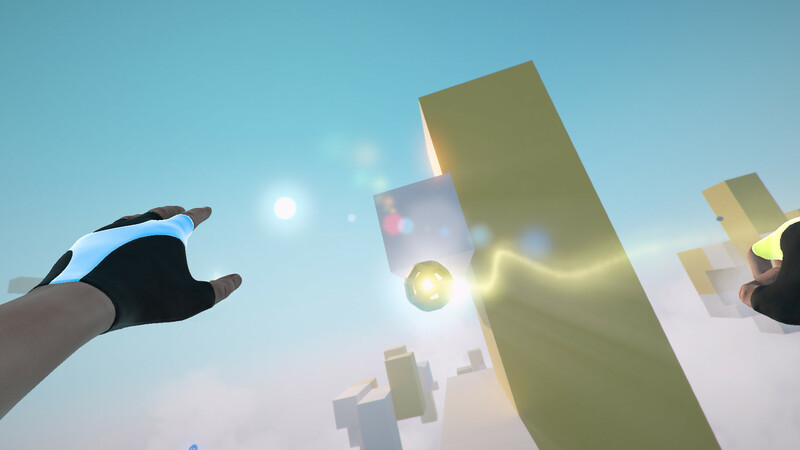 In Welkin Road you use your two grappling hooks to solve movement-based puzzles. While I was in the process of finishing Welkin Road, I started looking at potential studios I could join. That’s when I saw a tweet from Frictional, mentioning that they were looking for a designer / programmer. I didn’t think I was ready, but I figured this was my only chance to work with the company, so I sent my resume in anyway. To my big surprise they offered me a work test, to see whether I was suitable for the role. I gave it my best, but after I sent in my project I tried to prepare myself for the inevitable let-down. Instead I got a positive reply and an invitation to an interview. The final decision came a couple of weeks later. Spoiler alert: I got the job. Given that I was a big fan of Amnesia and SOMA, the decision to accept was a no-brainer. However, it took me quite a while to properly register that I had fulfilled my lifelong dream. A year and a half later I realize how lucky I am to be one of the few people who can wake up on Mondays with a smile on their face. After joining, I immediately started working on my introductory tasks aimed at learning the new tools. I joined at the same time as Max, so we bonded over struggling to understand all the new stuff. When those tasks were done, I started working on my first real project: designing and implementing eye tracking features in SOMA, which I will talk about in more detail in the next section. A while after I was brought on, the company started looking to set up a studio in Malmö. I already knew that if I wanted to make games, I would most likely have to move, so the decision to move to Malmö didn’t take me long to make. Finding a place to stay took a while, but I eventually managed to find a nice apartment and settle in, in no small part thanks to my incredibly kind and welcoming co-workers. 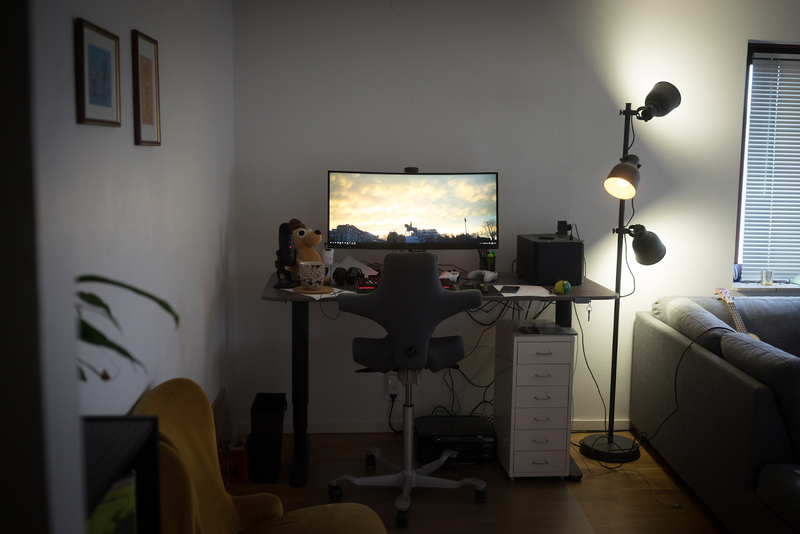 The setup in my new home in Malmö! 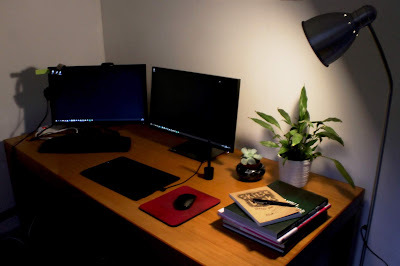 As promised, I will now spend some time talking about my adventures in eye tracking. After receiving a unit from Tobii, I first tested it with a bunch of games that already had eye tracking support. Deus Ex: Mankind Divided was a particularly useful use case study, since it had a robust implementation and used the eye tracker in interesting ways. I was initially very surprised at how well the eye tracker worked in that game, and how seamless and intuitive it was to use without putting any strain on my eyes. This gave me the confidence that we could use this to enhance SOMA. Once I got a feel for what the technology was capable of, I read through Tobii’s SDK documentation and code samples to figure out how it all worked. In simple terms, the Tobii eye tracker provides a continuous data stream of screen coordinates that represent the location on the screen the user is looking at. Think of it as firing 60+ laser beams per second from your eyes to your monitor. Bring it on, Cyclops! After I was done feeling like a superhero, I looked into how we could use this in our own engine, HPL3. Since Tobii’s SDK was easy to use, integrating it into HPL3 wasn’t too difficult, especially with the help of our engine programmer Peter. With the technical aspects more or less dealt with, I started thinking about the design of our eye tracking features, and how we could best make use of this technology to enhance the game. This included brainstorming sessions, quick prototyping and a lot of feedback from the rest of the team. It quickly became clear that while controlling and moving stuff around on the screen with your eyes is fun, it becomes tiring and uncomfortable really fast. For a good experience, the player must never be actively thinking about using their eyes. Instead, the game should react to the player’s natural eye movements and try to enhance the experience. A negative side effect of this design principle is that unfortunately quite a lot of features become very subtle and hard for the player to notice consciously, despite having an overall positive effect. The white circle is where the player is looking. Another interesting aspect of designing these features was how eye tracking could be used in a very immersive first person horror game. 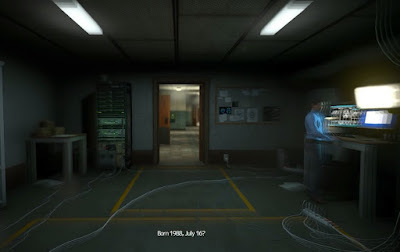 Horror games often rely on where the player is looking to trigger certain events, which always means a certain level of uncertainty about whether the player actually registered what was happening on the screen or not. With eye tracking, this uncertainty became very minimal, which meant that the timing of a lot of the events in SOMA naturally improved. In the end, we ended up with a number of eye tracking features we were happy with. The most noticeable ones are extended view, which makes the viewport pan towards where the player is looking, and the ability to control the flashlight with your eyes. A number of enemies also react to the player’s gaze, such as the flesher monster becoming aggressive when looked at and teleporting when the player blinks, or the deep sea diver stopping when the player maintains eye contact. Other features are much more subtle and designed to enhance immersion and mood. For example, staring at creepy and gory scenes zooms the screen slightly, giving the impression that Simon is in a trance or shock-like state and can’t look away. When the player looks at enemies, the screen distortion effect intensifies to further discourage players from looking at them. Additionally there are some really secret ones, such as Ross’ distorted computer messages appearing exactly when the player blinks, to further reinforce how Ross is inside Simon’s head. My personal favorite, however, is a subtle reaction from K8, the incredibly friendly and helpful swimbot, which gives the player a small opportunity to communicate with it. The developer showcase of eye tracking features. In summary, working on eye tracking has been an incredibly fun and rewarding experience both because of the challenge, knowledge gained and the creative freedom. Besides, who doesn’t enjoy firing lasers with their eyes? The end result hopefully enhances the SOMA experience, even if just a tiny little bit. 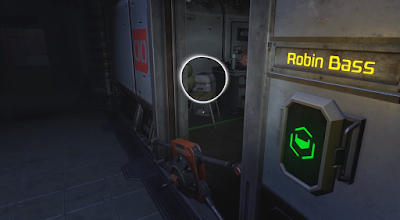 So if you have the PC version on Windows and a Tobii eye tracker, consider giving an even more immersive version of SOMA a go! 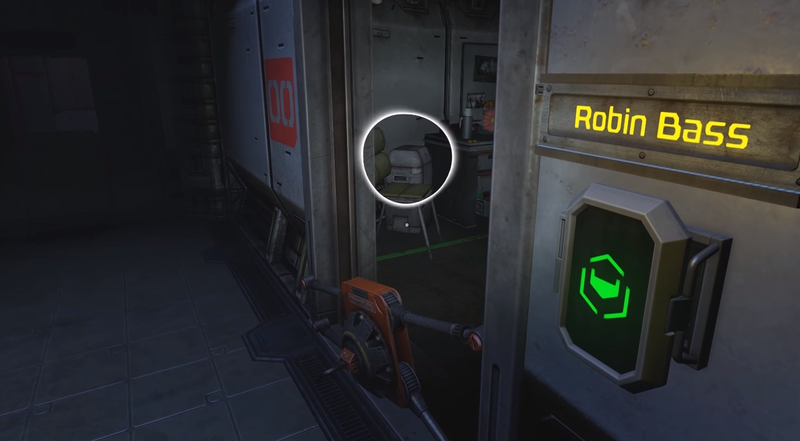 The official trailer for eye tracking in SOMA. Eye tracking is just a small part of my work at Frictional though, as I’m currently working on one of our next projects. I’m already really proud of what we’re creating and I’m happier than ever with my choice to follow my dream of making games. We’re all really excited to be able to share more of what we’re doing, but until then we’ll just keep doing our best. 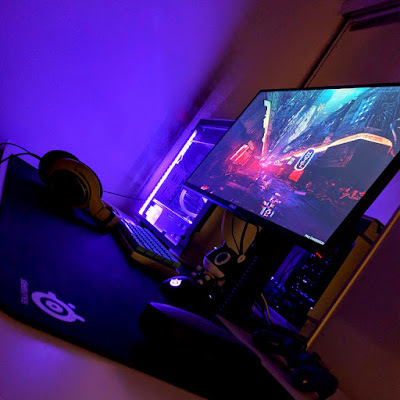 This also reminds me it is time for another gaming night, to keep our spirits up! Quality Frictional Humour™ from a recent Jackbox Party night. Wanna see who else works at Frictional? Check out the rest of the People of Frictional posts! Hi, my name is Alex and I am one of those people on this planet who make games for a living. I joined Frictional Games almost a year ago as a gameplay programmer & designer, and I am currently working on [REDACTED]. Despite my warm Sicilian blood, I ended up living in this beautiful yet terribly cold place called Sweden, where I obviously work from. I got exposed to videogames as a kid, watching my dad playing Lucas adventures (that Indiana Jones and the Fate of Atlantis intro sequence will forever be impressed in my memory) and – like most people these days – I just spent a lot of my free time playing games. I remember that when I was really really young I would draw labyrinths on paper and let my best friend play them as I was adding moving traps and enemies on the go. It was a complete nonsense but I think it’s the earliest somewhat-interactive thing I’ve ever made. It was pretty fun. During my teenage years it was really clear to me that I wanted to work with games, so I started doing game journalism and with two friends of mine I would spend nights playing games but also making terrible prototypes, studying some programming in our spare time. My first playable game was obviously an extremely generic shoot-em-up with horrible graphics and some keygen music slapped on top. Figure 1: On the left: me eating while being bored to death with my new programming book. On the right: me probably being overly excited about making something shoot a bullet into something else. I’m also wearing swimming trunks for some reason. I eventually decided to move to the Netherlands to study and get my bachelor’s degree in Game Design and Production. Living there was a great fun and allowed me to be part of an active gamedev community. I went to gamedev events, met many developers, expanded my network and opened my one-man-company called Kalopsia (hi Josh Homme!). I also joined a lot of game jams, one of which landed me an internship at Guerrilla Cambridge doing some level design on RIGS: Mechanized Combat League for PSVR (at the time the Morpheus prototype was just a bunch of lenses and cables put together with tape). I ultimately started my own small but very personal project called Memoir En Code: Reissue, which I eventually released on Steam/Humble/GOG (totally not a plug). I worked solo on that project for quite some time, and after the release I felt the need to change gears and work in a team again. A friend of mine told me there was an opening at Frictional Games, and how could I not apply to the company that made SOMA? Fun fact: after I submitted the work test I travelled to San Francisco for GDC17, and Thomas and Fredrik were there as well. We did not meet in person though, and I ended up spending most of the conference thinking about the test; it was actually a bit stressful and distracting! I found a partner for a new solo project that I was planning to make in case stuff didn’t work out, but I got a positive response from Frictional and I obviously agreed to join the team. I’m not crazy after all. 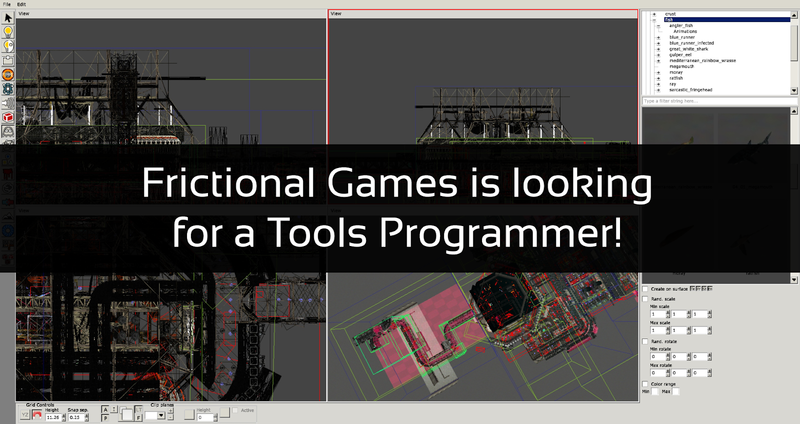 During the first weeks at Frictional I spent my time learning the tools and the overall work pipeline. This resulted in me creating a short psychedelic game where you put out fires by peeing on them, while Slayer music plays in the background. It’s probably the best thing I have made to this date. At the beginning there was a lot of stuff to learn and take in. But to be honest that was the entire point why I pushed myself into a new environment; you can’t really become a better developer if you don’t expose yourself to new stuff. After I was done with the intro tasks I quickly jumped into production, working with Aaron (we are officially called the A-Team). He works from the UK, but we have a very clear line of communication; we are fairly independent, but we are always in sync, which is working out very well for us. I spend most of my days scripting events, moving a door 0.25 units to the left to improve visibility and making that sound play with 0.5s delay because it just feels a bit better. The rest of the day is spent drinking tea with my desk-buddy Max and mostly hoping that nothing breaks. I have also spent some time making small changes to the debug tools we use, just to make the pipeline a bit smoother or a bit more comfortable. I juggle between working from the office and from home, depending on the amount of isolation my brain needs. Being able to do that is a big privilege that has a very positive creative impact on me. Figure 2: my workstation at home. I have the same desk at the office and the same type of chaos ruling over it. Since designing games is a complete dream-job, I try to keep myself busy by doing other creative things on the side. I spend quite some time doing photography, which I enjoy quite a lot. When I travel I always bring my a7ii with me, practicing and slowly improving over time. Aside from that, I also very much enjoy making music. Some months ago I got a Teenage Engineering OP-1 which I am having tons of fun with, and I am now playing a bit of ukulele. I guess I won’t be happy if I don’t mention my biggest love. I have a deep (and almost unhealthy) love for anything Kojima makes. 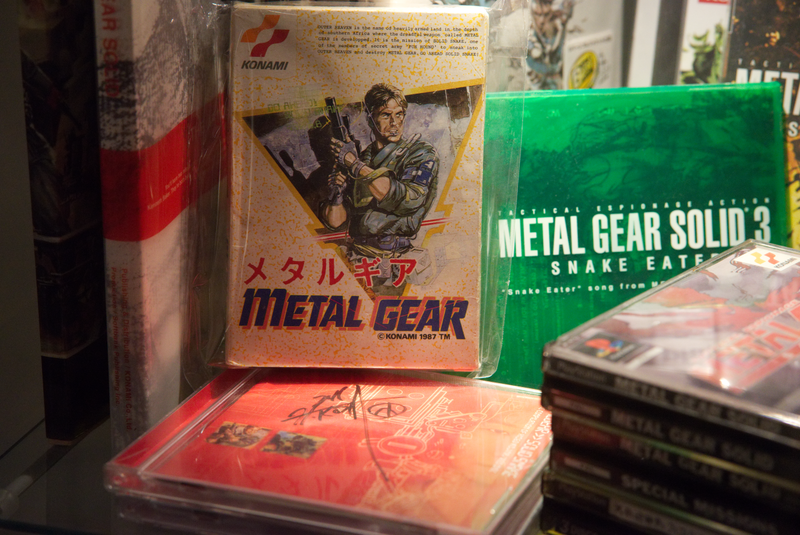 Over the years my love for his games went a bit overboard (I am the person behind the Metal Gear Timeline which you should totally check out if you are new to the saga) and now I ended up with a corner of my apartment being completely dedicated to his work. I keep adding stuff to the cabinet and now I probably need a new one after I got some new loot from my recent trip to Hong Kong. I fill my existential void with Metal Gear stuff, I need a doctor. Oh, and you can find me on Twitter as @AlexKalopsia!